Lake Bluff Golf Club was established in 1968, and in its 50-year history the course has become a “must-play” destination for golfers. 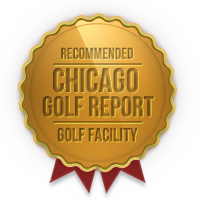 Located on the scenic North Shore of Chicago, the golf course is one of only a few public facilities offering private club caliber amenities. The Travel League is intended as an introduction to competition. It is geared towards young golfers who can demonstrate basic playing skills, a primary understanding of golf rules and etiquette, have previous golf course experience, and show an interest in competitive golf. Junior Travel League introduces the skills that are imperative for competitive play. Travel League classes meet twice per week, and each class is 90 minutes. In addition, students will be invited to compete in tournaments that are held once per week. The Elite Skills I (ESP I) program is designed for the experienced junior golfer. This invitation-only program is open to standout players from the Travel League program who are interested in competing in high school and beyond. Participants in ESP I should have a desire to play at a high level and have demonstrated a dedication to improving their game. ESP I classes meet twice per week, and each class is 90 minutes. In addition, students will be invited to compete in tournaments that are held once per week.